Everyone knows that in the game of football, quarterbacks are looked up to as team leaders. That's why we're so pleased to see some NFL QB's setting great examples of… wait for it… excellent oral hygiene. 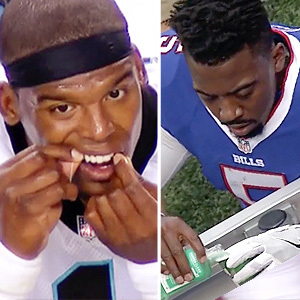 First, at the 2016 season opener against the Broncos, Cam Newton of the Carolina Panthers was spotted on the bench; in his hands was a strand of dental floss. In between plays, the 2105 MVP was observed giving his hard-to-reach tooth surfaces a good cleaning with the floss. Later, Buffalo Bills QB Tyrod Taylor was seen on the sideline of a game against the 49ers — with a bottle of mouthwash. Taylor took a swig, swished it around his mouth for a minute, and spit it out. Was he trying to make his breath fresher in the huddle when he called out plays? Maybe… but in fact, a good mouthrinse can be much more than a short-lived breath freshener. Cosmetic rinses can leave your breath with a minty taste or pleasant smell — but the sensation is only temporary. And while there's nothing wrong with having good-smelling breath, using a cosmetic mouthwash doesn't improve your oral hygiene — in fact, it can actually mask odors that may indicate a problem, such as tooth decay or gum disease. Using a therapeutic mouthrinse, however, can actually enhance your oral health. Many commonly available therapeutic rinses contain anti-cariogenic (cavity-fighting) ingredients, such as fluoride; these can help prevent tooth decay and cavity formation by strengthening tooth enamel. Others contain antibacterial ingredients; these can help control the harmful oral bacteria found in plaque — the sticky film that can build up on your teeth in between cleanings. Some antibacterial mouthrinses are available over-the-counter, while others are prescription-only. When used along with brushing and flossing, they can reduce gum disease (gingivitis) and promote good oral health. So why did Taylor rinse? His coach Rex Ryan later explained that he was cleaning out his mouth after a hard hit, which may have caused some bleeding. Ryan also noted, “He [Taylor] does have the best smelling breath in the league for any quarterback.” The coach didn't explain how he knows that — but never mind. The takeaway is that a cosmetic rinse may be OK for a quick fix — but when it comes to good oral hygiene, using a therapeutic mouthrinse as a part of your daily routine (along with flossing and brushing) can really step up your game. If you would like more information about mouthrinses and oral hygiene, contact us or schedule a consultation.